Only a 7 if you like large maps where sniping is fun, so if you like sniping this is the map for you, you masochist! It's a run down city like map, lots of tall buildings to snipe from and plenty of areas for close combat and large open spaces, however you have to like the "seek-n-destroy" way of playing, no MONSTERKILLS! in this map :( Modeling and texture is pretty good, music definetly sets the mood. Worth downloading if you like large maps and/or sniping. One of my Favorites. Its Excellent when played as a dark match. Only one thing I'd like to see added is working trains simular to what you find in DM Dogtown and DM Fight night(As if other players arnt enough of a hazzard). Only negitive point is the bots tend to be rather predictable. But they DO have a great range of paths set up for them. 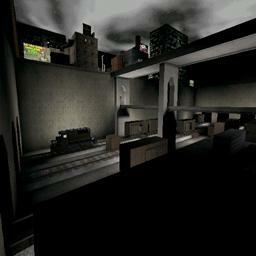 There is also a ctf version of this map called ctf Urban Sniper. Ps yes its true as stated before, this map is geared for Sniping. Another good City map Id recommend is DM Zaltig. Play this map online all the time. Big enough for a large group of players, and there are plenty of places to snipe!! I find this map excellent for a snping feast though that chilling wargate music made it sound like a diseased citizen would eat you while youre getting a headshot. I hope a UT2003 version comes out! Bad Architecture, texturing and the gameplay could be improved. Download Zeitkind, now that's a city. examples: Cloud/sky texture is unlitted. Skyscrapers are smaller getting cubes on top of each other. Hallways are blank with no deco at all as most of the indoors. You should thank me for giving a 4 though it isn't worth it. I did not like the lighting either (Was there light?) The texures was bland. The music selection was nice though and the bots performed well. I've had this map for ages and still come back to it. I like big maps and sniping so I like this map. A fun, LARGE experience but not visually stunning. Additional comment to the mapper: I have started a conversion of this map to UT2K4 and would like to know if you are planning an "official" UT2K4 conversion. Of course my conversion would be for my own use and not for distribution. Basically I've taken your geometry and ported it from UT for relighting, retexturing and a new weapons loadout for UT2K4. It's bound to be a bit lame as this is really my first experience working with Ued. If you have any objections to this "private" conversion or thoughts or ideas please contact me through my Beyond Unreal forums subscription (I won't be leaving my real name or email here). Still my fav map (what comes to snipermaps). Big and fantastic for a 32 player (4 teams) fraggin too. This map is Huge! Also very well constructed. With 10 bots you may be searching around a while before you find anyone. A bot made me laugh on this level, she got those jump boots jumped off a building disapeared into the sky and then splattered herself in the street. It was funny till I realised she was on our team! Ill definately be keeping this map. Nice map. I play this on online. One of the servers are [PURE] Fraggalonia SniperArena #1 "Server always have people in it" It's a team deathmatch thing and all they use are sniper rifles. I already seen 25 pople in it and I still could not find anyone from the other team until i got a bullet in my head. One of the best city based sniper maps out there. It's dark cause it's a hide'n'seek hunting map and an hours game can easily result in a dozen frags or so making you the winner! Perfectly designed for excellent sniping matches. gameplay... once again is for snipers. All you can do in this map is get a sniper rifle, get to the hihgest building and snipe all bots that spaw on roofs which have no ways down. bots on ground run back and forward. Once again you can see the split between people who play UT, and those who dont. First off as a player this map rocks if you like sniping, the fact that it was built in 2001 explains the lack of deco, which means absolutly nothing where gameplay is concerned, and to be honest sometimes less clutter in a map is better, i cant stand the guys who comment only on the looks of a map especially when it was made at a time that a map like LastCrusader][ would crash your PC or give you framerates of 2 if you tried to play it, belive it or not, there is a reason why Quake 1 maps didnt have the detail level of 2k4. Based on the fun factor of gameplay which IMO is about 8 points out of the ten and not 50/50 gameplay vs looks as most tend to think, this map must score high because it does what the author set out to do and makes for a fun sniper match, I think those of you who rate maps low solely based on the looks or the fact you personally dont like that style of gameplay should stop commenting all together because it is obvious you have no clue as to what makes a game fun to play, a good example is a buddy of mine who fell in love with UT even tho he was playing it on a Mac with a 2mg onboard video in software rendered, LOL I dont think it was the awesome graphics that got him hooked.